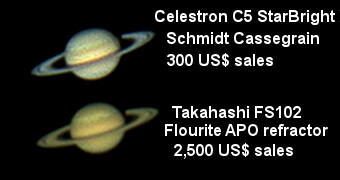 This week I had the chance to test a Takahashi FS102 refractor apochromatic fluorite telescope and also a Celestron NexStar 5SE Schmidt-Cassegrain catadioptric telescope. First one has an aperture of 102mm and second one of 125mm plus a central obstruction. Their light gathering power is similar and also their theoretical resolution. Nevertheless I wanted to check by myself the mythical optical quality of FS102 in contrast to the well-known Celestron. Tests were made using the same camera to capture video and similar weather conditions both nights. I took in both cases a video of the planet Saturn when reaching the meridian, its maximum altitude. Celestron C5 perform flawlessly because I could get a sharp view of Saturn and its ring at 500x magnification. Takahashi also let me reach that high powers with a crisp result. C5’s focuser is very precise, but Takahashi’s is even more being a rack and pinion system. Focusing the FS 102 was very pleasant due to its smoothness and accuracy. Probably a better contrast in visual images delivered by refractor telescopes also gave it an advantage here. Trying to resolve fine details, in both telescopes I could see the shadow of Saturn over the rings clearly. Here it is the final picture after applying Registax and Fitswork4 to both videos. Probably FS102 performs better on wide field astrophotography, but on planetary imaging this picture above is my conclusion. Usually we see the Moon as in a gray scale picture, with no color details. Nevertheless the Moon has different hues depending on the chemical composition of the terrain. For example, Mare Tranquillitatis has a blue tone due to its titanium high density. Processing a Moon picture computationally, we may exaggerate its colors, giving high saturation to RGB colors. In the resulting image, Mare Tranquillitatis is the most blueish dark area. Equipment: Telescope Tanzutsu Catadioptric 114/1000.